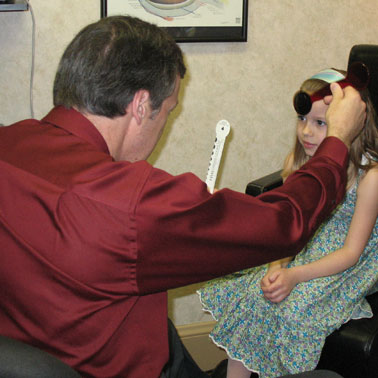 Dr. David B. Gaudreau established Putnam Vision Center in 1988. Historically, the practice dates back to 1883 when Dr. Harry W. Thompson started his optometry practice in Putnam, Connecticut. In 1917, Dr. James W. Hall, Sr. became an associate. His son, Dr. James W. Hall, Jr. joined the practice in 1947. Dr. James W. Hall, Jr. obtained certification for visual training at the prestigious Gestalt Institute. He retired in 1994. In 1997, Dr. Gaudreau acquired the practice of Dr. Rene Desaulniers who was a valued member of the American Optometric Association Board of Examiners. He was a local optometrist for 50 years. Putnam Vision Center has a legacy of providing personalized, professional optometric care for over 125 years. 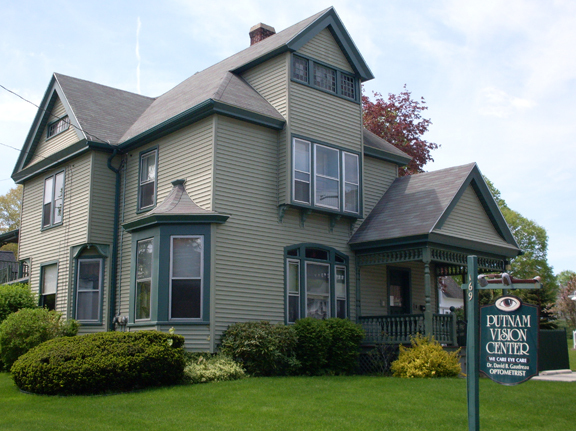 Putnam Vision Center still operates today in its historic and iconic green Victorian building in Putnam, Connecticut. Don�t let our historic appearance fool you; Putnam Vision Center utilizes modern, state of the art equipment and techniques in order to provide you with the best possible service. We offer many services, such as comprehensive adult/pediatric vision testing, eye disease diagnosis and treatment, laser eye sugery evaluation, and computer assisted eye exams. We utilize the newest progressive lens technology as well as transition lenses, polarized lenses, Hi-Index lenses, polycarbonate lenses, and Anti-Reflective coating such as Crizal. We stock hundreds of frame styles for all ages and tastes, including brands like D&G, Vogue, Flexon, Carrera, CFX, Nine West, Kate Spade, Silhouette, Revolution, Oakley, Ralph Lauren, Safilo, Elle, Bellagio, Juicy Couture and more. When it comes to your contact lens needs, we are up to the challenge. We accept most health insurances including Blue Cross and Blue Shield, Medicare, Cigna, United Healthcare, Oxford, Eyemed, Aetna, VSP, and other insurances. Also, as an effort to stay modern and offer the best possible service to our patients, we�ve implemented ways for you to fill out intake forms via our website and submit them to us online! We�ve also given you the option to print out the forms if you prefer to bring hard copies. Rest assured, our online forms system is protected by SSL Encryption technology to insure safe and confidential delivery of your personal information.